I used to drive to work via Kennedy Road in Hilden on my way to the school where I taught. As an alternative to the #2, its trees, gravel road, and access to watershed trails seemed like an oasis of a detour that took only a few frosty minutes longer to drive. I often wondered if land might became available. That was when my family was young and we lived in a beautiful turn of century home, close to Victoria Park in Truro. I loved where I lived, my life was full, and those were merely thoughts. One day I heard that land might become available on that road. Negotiating a piece removed me from my comfort zone. I was able to purchase a piece overlooking the Truro valley with a lower portion bordering on a stream. In the next 2 years I designed a house, hired a contractor who did an amazing job, and I moved in last December. I plan to cut trails some day but snow shoes in winter can easily show you around. 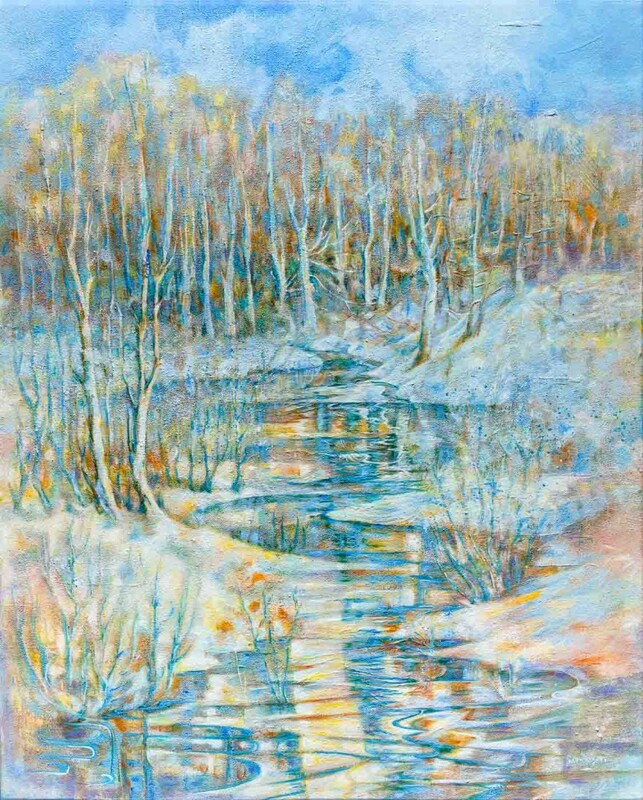 The painting “Freeze and Thaw” began last January. With so much winter snow I was able to easily traverse the deep landscape and get to places I could not in spring or summer. Finding the high keys of cerulean and orange, I wanted to show winters melting snow and frozen shadows hidden amid the scruffy winter trees. The painting is approximately 30” X 24” and reflects one point of my life’s journey. I grew up there to love your storyline . Kaulback st. Really touched home. HI Hollis – thank you very much for making a comment on my website!